Senior Pastor Rebecca Henry joined First UMC in 2017. She and her husband, Joe, enjoy spending time with their two school age children. Prior to coming to First UMC Rebecca served at New Life United Methodist Church in Seymour and Shared Covenant Ministries in the communities of Horicon, Juneau, and Lowell. Rebecca worked as a youth minister in Montague, Michigan before entering seminary. Rebecca graduated with a BA in Peace and Global Studies from Earlham College in Richmond, Indiana, as well as an MDiv and MA in Spiritual Formation and Evangelism from Garrett-Evangelical Theological Seminary in Evanston, Illinois. In addition to her ministry at First, Rebecca serves as co-chair for the Wisconsin Annual Conference Board of Ordained Ministry. Rebecca enjoys the time she is able to spend with her family in the Upper Peninsula of Michigan, but when that is not possible she enjoys reading, watching movies, playing games, and walking. Director of Christian Education / Outreach and Volunteer Coordinator Katie Woodrow has been part of the First Church staff since 2011. She and her husband Matt have two school age children. With a degree in Biology from UW-Platteville, prior to First Church, Katie worked in various manufacturing locales in quality assurance management. A native of Menasha, Katie has deep roots in the area which only continue to grow as she serves as a Girl Scout leader and in the Parent Teacher Organization at her childrens' school. She’s also an avid runner, and has completed the Fox Cities Marathon several times. 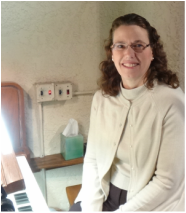 Organist Joy Veldboom has been our primary musician since 2005. Joy and her husband Brian have a grown daughter and three grandchildren. When not creating music Joy works on the executive team of one of our local Credit Unions. Pastor of Congregational Care Tony Fuller has been part of the First Church since 2008 following his retirement from full time ministry. Tony has served as pastor in United Methodist Churches all across the state, Montello and Princeton, Rhinelander, Niagara and Goodman, as well as Glenwood, Downing and Emerald. Tony grew up in Oconto County and is a graduate of Ripon College and Garrett-Evangelical Theological Seminary in Evanston, Illinois. In addition to his work here at First Church he also serves as the Mission Initiative Consultant for the United Methodist Church in Senegal and every spring taps hundreds of sugar maple trees in order to produce many gallons of his wonderful maple syrup. ​joined the FUMC staff in 2015. Amy is a Neenah native with a background in accounting and retail sales. Amy enjoys the outdoors, cooking, and spending time with family, especially her husband and two daughters. Carolyn Tietje, Director of Music Ministry, leads our Voices of Praise adult vocal choir as well as our Joyful Noise children's handbell and Chapel Ringers adult handbell choirs. Carolyn took on leadership of Chapel Ringers in 2016 and Joyful Noise in 2017, and brings to over 20 years of music experience to First Church. Carolyn enjoys her retirement and is a voracious reader. Children's Choir Director Jessica Muller has directed our children's choir for children since 2014 and has expanded our offerings to provide musical opportunities for children in 4K through youth. Jessica also directed the First Church adult choir from 2008 - 2018. She and her husband Bob have four children. Jessica teaches music to Middle Schoolers in the Neenah School District and directs the Amabile choir as part of the Badger State Girls Choir. John Quella joined the First Church Staff in 2013 as our custodian. A native of the Fox Cities he very much enjoys riding his motorcycle in the summer along with spending time with his extended family. Alyssa Schafer grew up here at First Church. She and her husband Rocky have four children. Alyssa works in the nursing field in the area. Kayla Drutt grew up in California and moved to Wisconsin to be closer to family. Kayla is a teacher at a local pre-school and day care. Susan Benecke and her family found FUMC when they moved to Neenah a few years ago. As a teacher at a day care center, she's a natural in the nursery and enjoys bringing her two girls to participate in church activities, especially music, a talent Susan shares with them! Tara Colby (not pictured) also grew up as a part of First Church. She and her husband Aaron have two children, a boy and a girl. Tara came on as part of our nursery staff after many years of being a friendly volunteer working with the children. Questions About First Church? Contact us by Email!